My name is James Coyle and I am the Director of Performance and Evaluation at the Interior Health Authority; I’m also involved in the Evaluation Mentoring Canada initiative and an active evaluation podcaster. Even though the AEA annual conference is right around the corner, I want to tell you how I’ve used AEA resources outside of my conference sessions. I’ve always tried my best to avoid the most common pitfalls associated with ‘death by PowerPoint’ (DBP). However, ever since an interview with Stephanie Evergreen for a podcast about p2i I’ve been even more concerned with the quality of presentations I’m delivering in my own organization. After reviewing the p2i resources I couldn’t ignore the fact that there was there was still plenty of room to improve my presentations. The good news was that all of the resources I needed to help me were in one place. Rad Resources: AEA’s p2i website and tools are great yet I tend to focus on 3 resources for non-AEA presentations in my organization. The 2-page Presentation Assessment Rubric is a great checklist that helps people give you feedback on your presentation and generates scores on 3 key elements of your presentation: 1. Message, 2. Design and 3. Delivery. Try using it during practice sessions of your presentation. 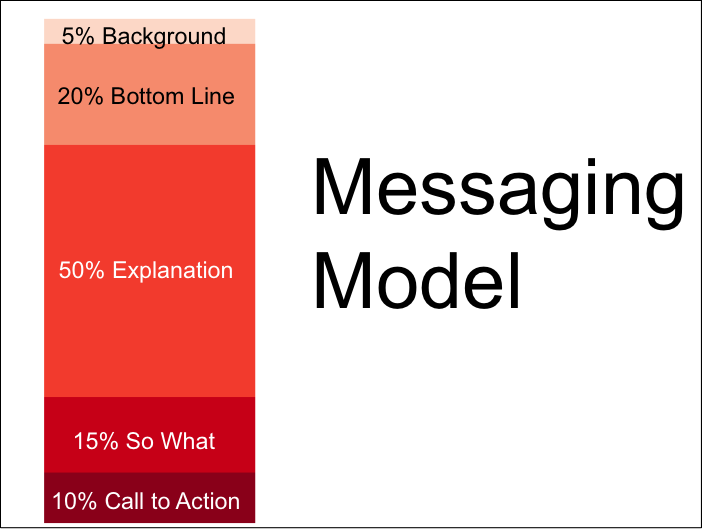 The Messaging Model Handout is critical in helping me structure my presentation and figure out how much time to spend on each part of a presentation. If I’ve only got 15 minutes to present to busy Senior Executives I really need to plan out the structure and timing of my presentation ahead of time. Lastly, the Slide Design Guidelines are an indispensible checklist to ensure your slides’ graphics, fonts, color, and other elements support your audience’s learning. Hot Tip: Share these resources with your non-evaluation colleagues in your own organizations. I share the p2i resources with my health care colleagues whenever possible because the principles behind giving great presentations apply to their roles too. Lesson Learned: If you are giving a webinar test your slides on the software platform ahead of time. After spending hours (days?!) of hard work creating a presentation recently I was very sad to learn that the high quality graphics we used for our slides were distorted on the audience side of the webinar (even though the slides looked fine on my local screen). I didn’t test the presentation on the platform ahead of time; that won’t happen again!